Building houses on cliff edges are nothing new. There are many castles and manors built on rocky coasts and high up in the mountains around Europe and Asia, and they were built centuries ago. Their builders wanted to live on the edge of the world and that desire continues to live. In the contemporary design, we have this too and there is a fair share of cool houses built in places high up. Here are just four but truly wonderful monuments to fantastic architecture on the edge of a cliff. The first house goes even beyond the cliff and is a real cliff hanger. Albeit only a concept by Australian home designers Modscape, it allows the imagination go wild. We would really like this house built. Next is an actual residence in the suburbs of Sydney built by Durbach Block Architects. The design was inspired by the famous Picasso painting “The Bathers”. So in other words the architecture of the house is inspired by the curves of women bathing by the sea. The curves and big windows allow for great sea views and lots of light for a modern home interior. The third is a remote getaway house in the mountains of Yatsugatake, created by Japanese designers Kidosaki Architects Studio. Extending over the edge of a cliff this small but spacious house enjoys breathtaking views and brings the nature back to the interior. Our final cliff house is designed by Fougeron Architecture and built in California. 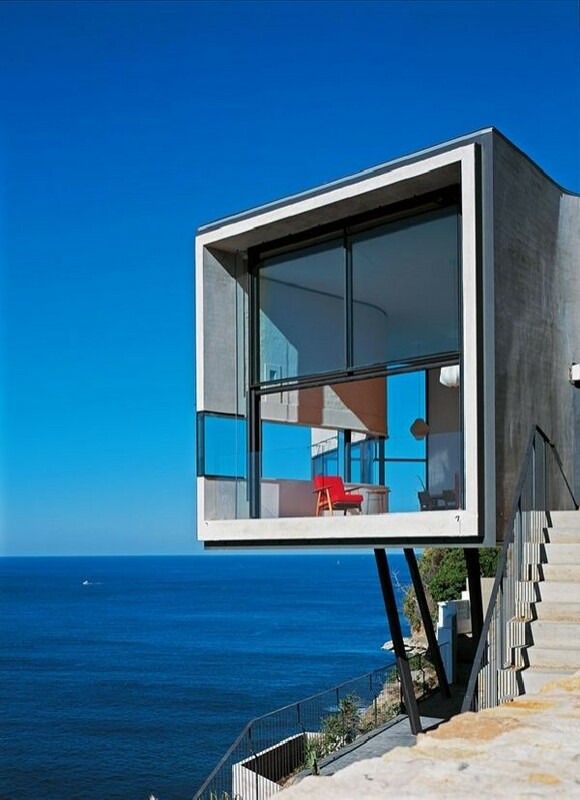 The Fall House, as it’s called, is designed to be inseparable from its surroundings as if a part of the cliff slope. It, of course, enjoys wonderful ocean views and a lot of light coming through huge windows and glass ceiling in parts of the house. The interior is truly remarkable too and we can see a nice modern style decor with marble floors and dark wood walls and ceiling.